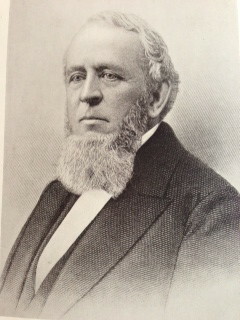 President of the Whitin Machine Works from 1870 until his death in 1882. Col. Paul Whitin placed his third son, John C., at a very early age as a worker in all departments of cotton manufacturing. Then, while still under the age of 20, he promoted him as manager. It was here that John C. acquired that intimate knowledge of mill practice and the requisites of cotton-mill machinery. As events proved, this was the foundation of the Whitin Machine Works. John Crane Whitin became the founder, genius, and workhorse of the Whitin Machine Works. The real start of the Whitin Legacy took root with his creative abilities and engineering talents. This was indeed to be first of many inventions that would make the Whitin Machine Works into a great textile plant. From 1831 to the Civil War, the Whitin family enterprises grew 8 fold. The payroll grew form the 2 assistants who aided in the production of the picker in 1831 to 1,620 employees in 1896. By 1896, the Shop produced all of the machinery used in a cotton mill, except roving machinery, mules and slashers. In response to regional, national and international demands, the factory grew into a floor space containing 1,750,000 square feet. Life in the village revolved around The Shop, providing the means and the opportunity for successive generations of mostly Europeans to immigrate. The Whitins built the entire village to support their expanding business operations. In all the company would erect 1,000 buildings (2200 units) to house their growing workforce. The work was hard and often dangerous but working and living in Whitinsville was much better than the average mill town. heating coal at company cost, free snowplowing, landscaping and property maintenance. The Whitins allowed any employee who heated their homes with wood access to their properties to cut down as many trees as needed, free of charge. The company constructed the first reservoir, creating Meadow Pond, (west of Main St.) which was the first system that pumped water directly into village homes. A typical sight on weekends would be the villagers sailing and fishing on the pond using equipment rented from the company provided facility. Through the 1860s the work schedule was 11 hours (7am-6pm) per day and 6 days per week. And yet, there was a long-standing tradition of allowing up to 4 unpaid personal days off per month. It is well known that during slow times in The Shop, John C. would hire idle employees to work on his property, farms, or, as in 1879, build the Town Hall as a memorial to his late father and mother. As the fortunes of the company grew, so would its generosity to the town. Many public buildings still in use today were built with Whitin funds and then donated to the town. Navin, Thomas R., The Whitin Machine Works since 1831: A Textile Machinery Company in an Industrial Village (Harvard University Press, 1950), pp 413-414.